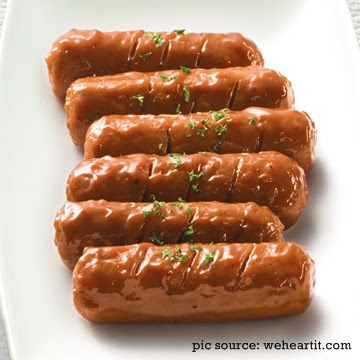 When cooked, sausage will expand faster and feels a little crispy on the outer surface, while the interior if we bite will bring the taste of meat and sausage seasoning blends or other flavors are cooked along with the sausage. Maybe you prefer to cook sausage in a way to fry, bake or broil sausage then you can learn some simple steps in cooking sausages with perfect results. Well here is how to cook the sausage in a way to fry properly. You can check whether the measures are you doing in cooking sausages for this is correct or not? Or for those of you who have never cooked sausage itself can apply this way. Turn the burner to medium flame, place the flat griddle pan models on the stove and wait a few minutes until hot. When the pan starts to heat marked by gave off fumes from the surface then you are ready to cook. Sausages are usually quite thick and greasy so you do not need to add more oil in the pan is too much, just add a little oil. But if you prefer to eat the sausages fried in plenty of oil and more krispy then you can add a bit much on the oil pan. Carefully place the sausages in a frying pan one by one. In a frying sausage, separated by the distance between the sausages so not touching each other. Such separation is essential when cooking so that each side of sausage can be cooked as it should not be hindered by the other side of sausage. If the sausage should we cook quite a lot then it means we have to cook sausage with gradual. After putting sausage in a frying pan, for a moment let the sausage remains in position without flipping and disturb beforehand. Only after a few minutes, flip side of sausage and turning and turning regularly every few minutes until the sausage to brown both sides. Time sausages to be cooked and browned determined by the size of sausages. If you are cooking the sausages that are large then it will take longer for you always wait for the process of cooking up sausages to be cooked and browned. The cooking process can be very long if we cook the sausages were too big and fat. Waiting until sausage being cooked may cause you get bored. To reduce the cooking time, if you can not wait until cooked well then before putting sausages into the frying pan you can cut the sausage into two flat pieces lengthwise in accordance with the length of sausage. Sausage better when thinner because it will cook faster if it is cooked. In the process of frying tap-tap sausage surface is also so completely exposed to the hot frying pan and immediately well cooked..